To catch crayfish, carry two empty coffee cans down to the bank of a freshwater creek briskly running over a bed of smooth, flat rocks. Remove your shoes, wade into the shallows, fill one can with water and place it nearby at the creek’s edge. With the second can in hand, ramble upstream (or down) in places where the the water rises not much higher than ankle-deep, lifting up the edges of rocks, with your can at the ready to scoop up any crayfish that might be sheltering under them. Collect your catch in the can you have left on the bank to receive them. When your hunt has yielded the makings for a reasonably-sized feast, build a small fire, and when the wood has formed a bed of coals, place the coffee can over it and let the heat do its work until your crayfish have turned a proper bright reddish-orange. 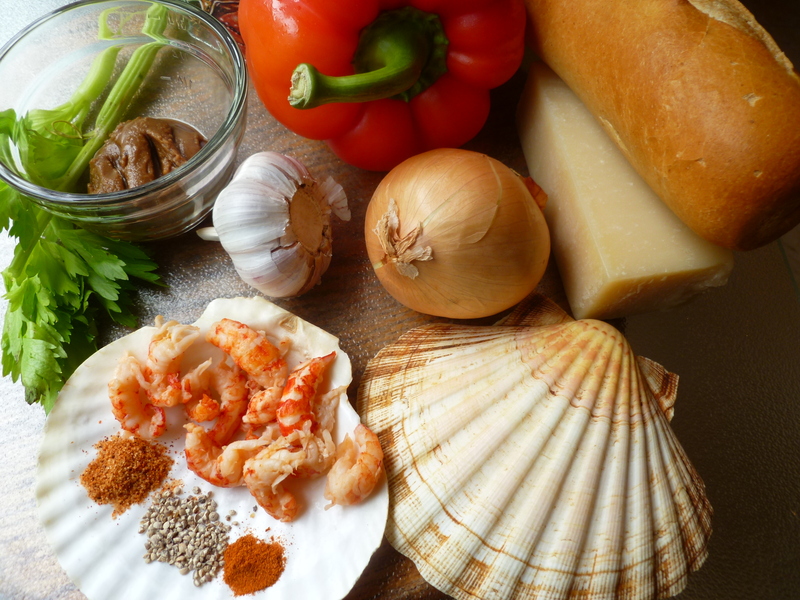 Drain the shellfish by dumping the contents of the can on a bed of pine needles or leaves and commence to dine. If you have had the forethought to bring along some Creole seasoning (or even Carne Asada powder) in a twist of waxed paper for dipping, the feast will be that much merrier. 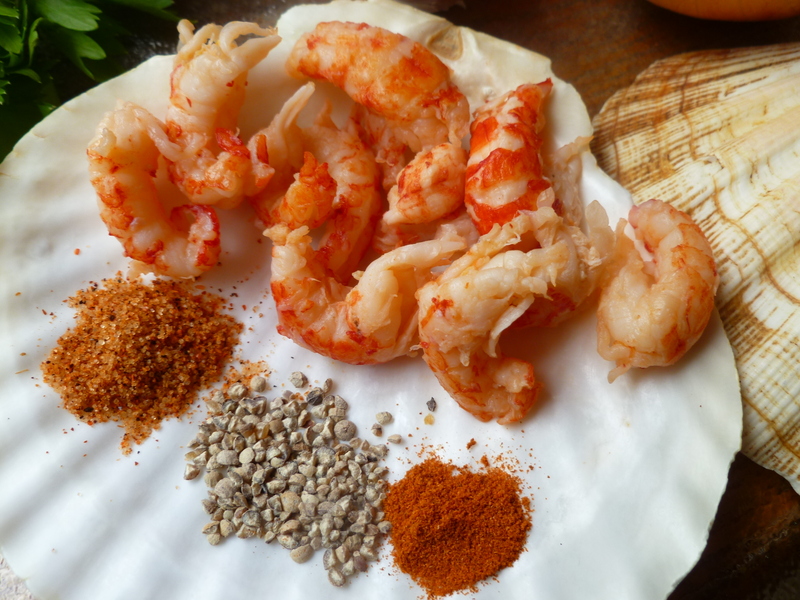 Making Cajun Crayfish requires a cooked and shelled supply of the main ingredient. But they may be had without foraging in a stream– from a supermarket, either frozen or in small refrigerated packets, already shelled and cooked. For this dish, you might have to forgo the thrill of the hunt and the out-of-doors cooking and dining, but this way of preparing the delicate, sweet-tasting shellfish is a very, very good one. 2 Tablespoons of ‘Chocolate’ (i.e. Dark Brown) Creole Roux: An explanation of how to make a Creole Roux is given below in Part I. 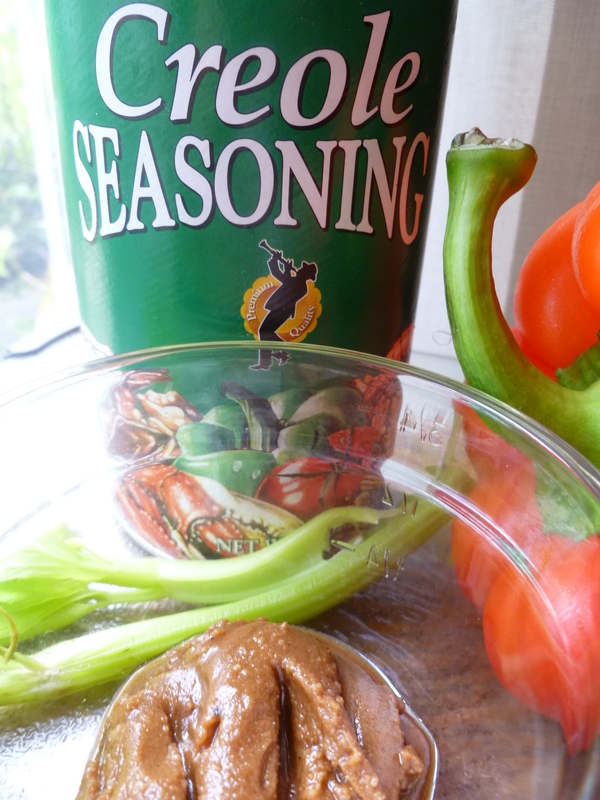 1 teaspoon of Creole Seasoning: Below in Part II is a good and simple recipe for blending your own Creole Seasoning. Another alternative is a to use a store-bought blend, such as Zatarain’s brand. a bag of cheap, coarse-grained Sea Salt is useful for sprinkling on baking pans to hold the scallop shells in place as they bake: a photo and description of this type of salt is here in a previous dk post. 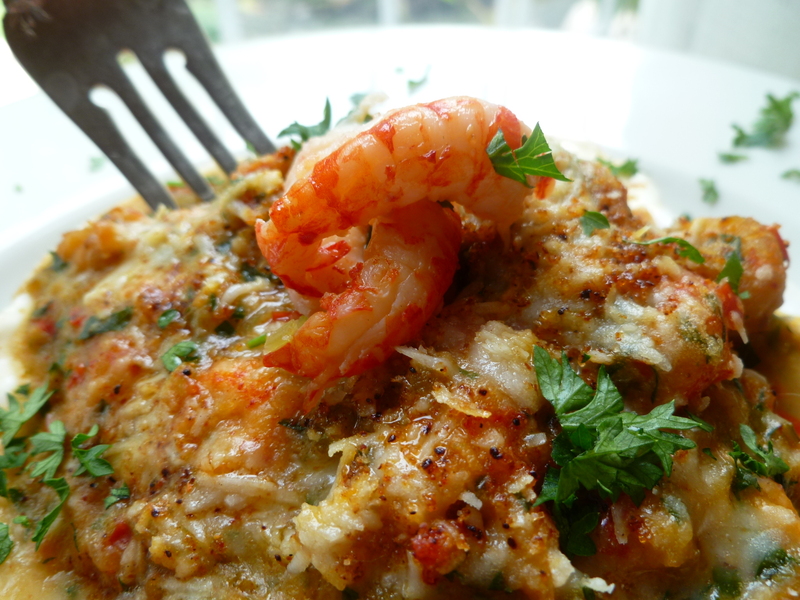 For baking the crayfish in gratin dishes, salt is unnecessary. 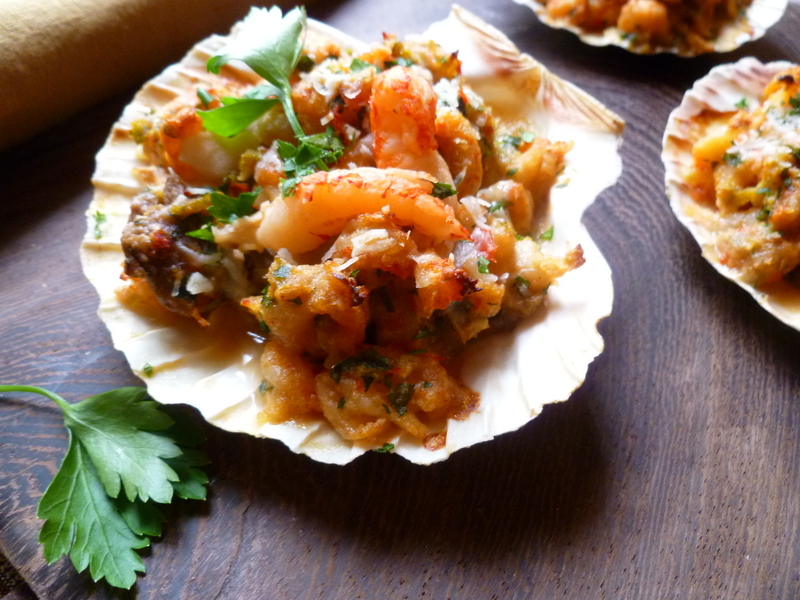 8 Scallop Shells or Individual Gratin Dishes: See alternative suggestions for baking Cajun Crayfish in tart shells in the note following the recipe. 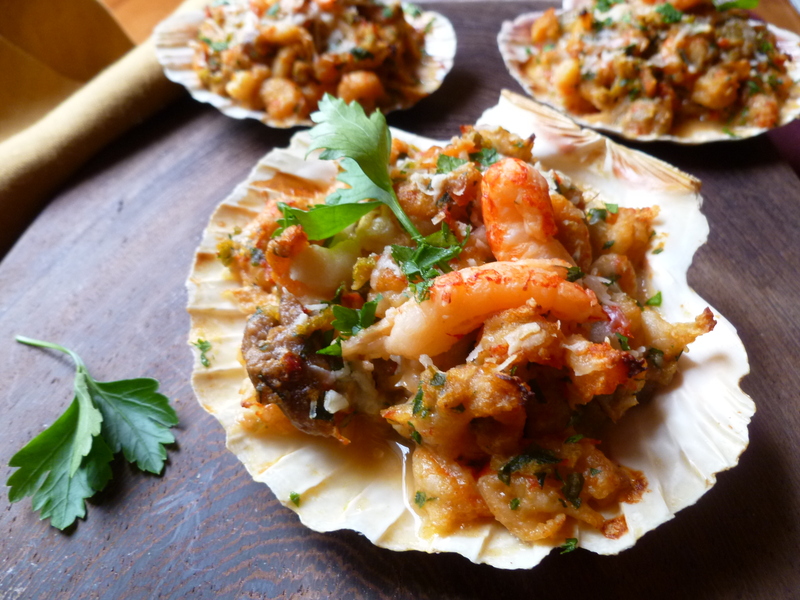 If using scallop shells: 1 or 2 rimmed Baking Pans sprinkled with a layer of Coarse Sea Salt: The salt isn’t essential but is very useful for keeping the shells in a stable, upright position. Here in a previous dk post is a photo (and description) of the cheap variety of salt used for this purpose. 1. Over medium heat, heat the oil in the pan until it is very hot. Sprinkle in the flour, whisking all the time, until there is enough of it to combine with the oil and the mixture forms a thick, cohesive whole. There shouldn’t be uncombined oil floating about in the pan. If necesssary, add a little more flour to bring the roux mixture to this point. 2. Reduce the heat to a little below medium, and whisk the roux continuously until it gradually turns a deep, reddish brown. This will take some time and can’t be rushed or the roux will burn instead of turning a chocolate color. Remove the roux from the heat and transfer it to a small bowl. 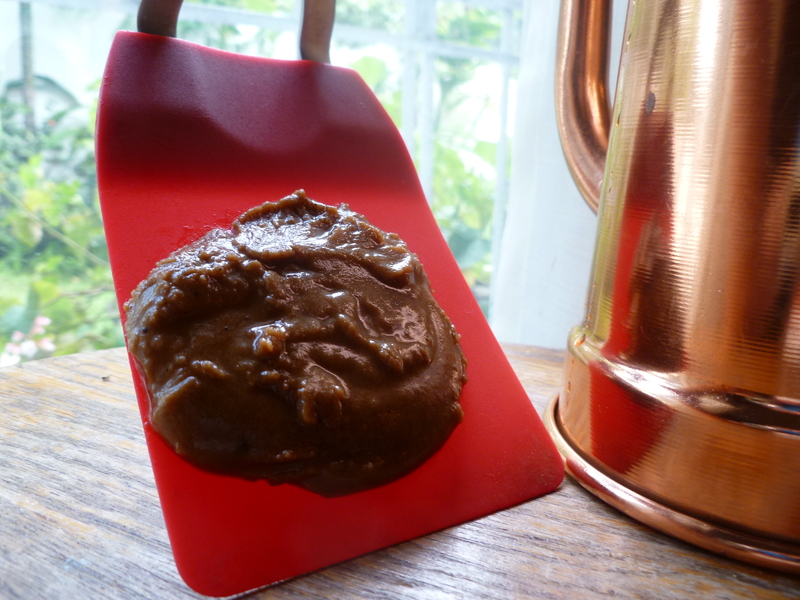 Any unused roux will keep for a couple of weeks in the refrigerator. 1. 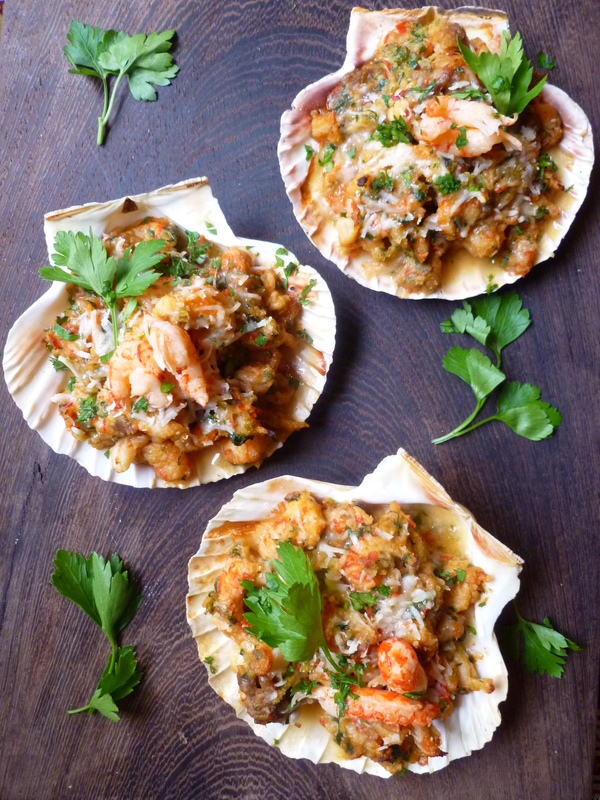 Preheat the oven to 350 F. Butter the scallop shells or gratin dishes. 2. Melt the butter in the casserole over medium heat. Add the finely chopped onion, green pepper and celery and cook them, stirring, until they are soft but have not begun to brown. 3. Add the vegetable bouillon and the 2 Tablespoons of roux and cook until the mixture thickens ( in about 5 – 10 minutes). Add a little more roux if the mixture seems thin…but probably extra roux won’t be required. 4. Remove the mixture from the heat and add the crayfish, cayenne pepper, white and black peppers, the garlic and the Creole seasoning. 5. Transfer the mixture to a mixing bowl. Stir in the beaten egg, the mustard, the bread crumbs and the chopped parsley. Add a few grinds of salt to taste. 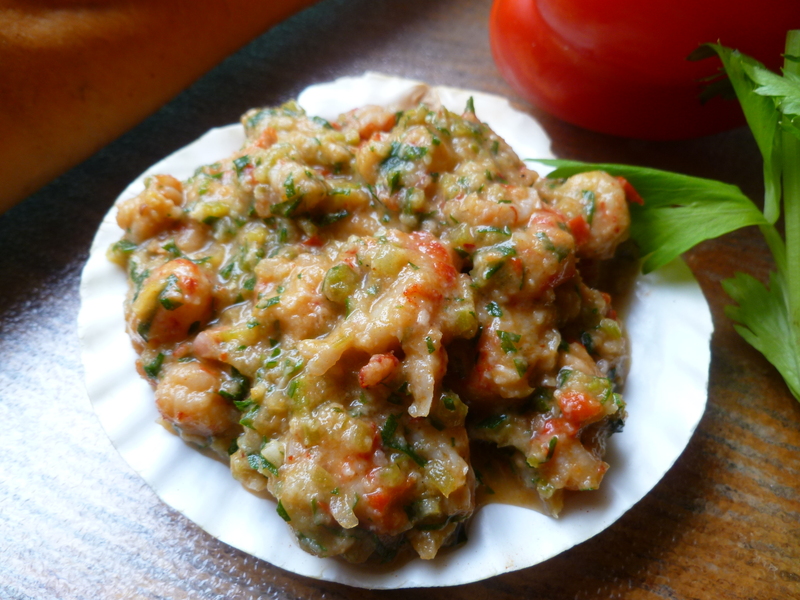 The crayfish mixture may be made up to this point and refrigerated to bake the next day. 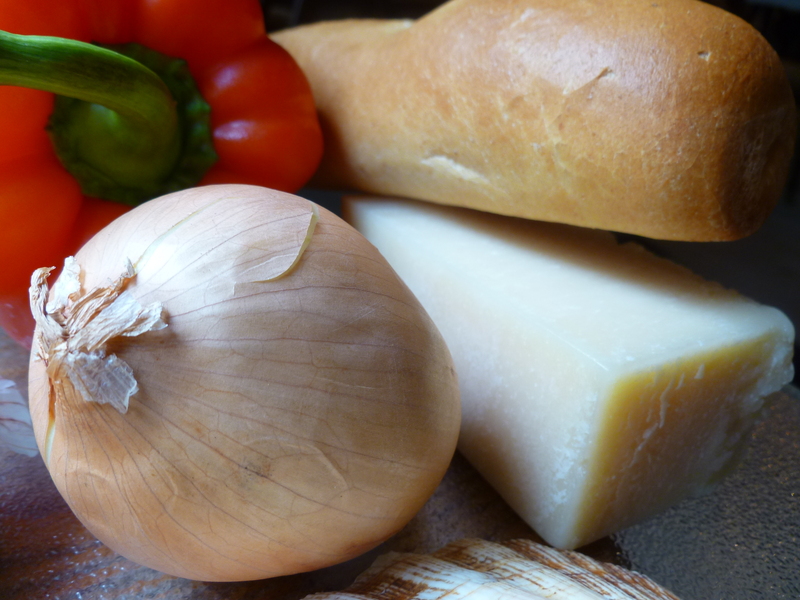 Bring the mixture to room temperature before baking it. 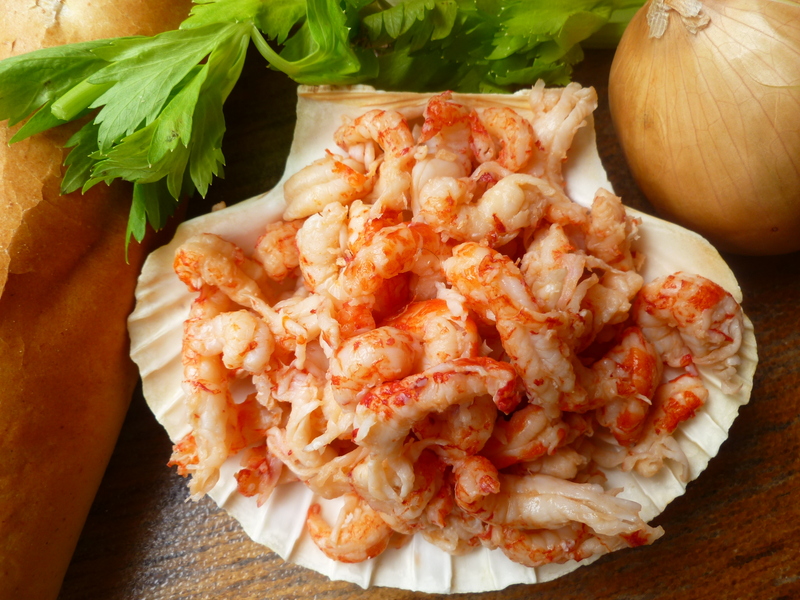 …Bake the crayfish for about 10 minutes or until the tops are golden and the mixture begins to bubble. 7. 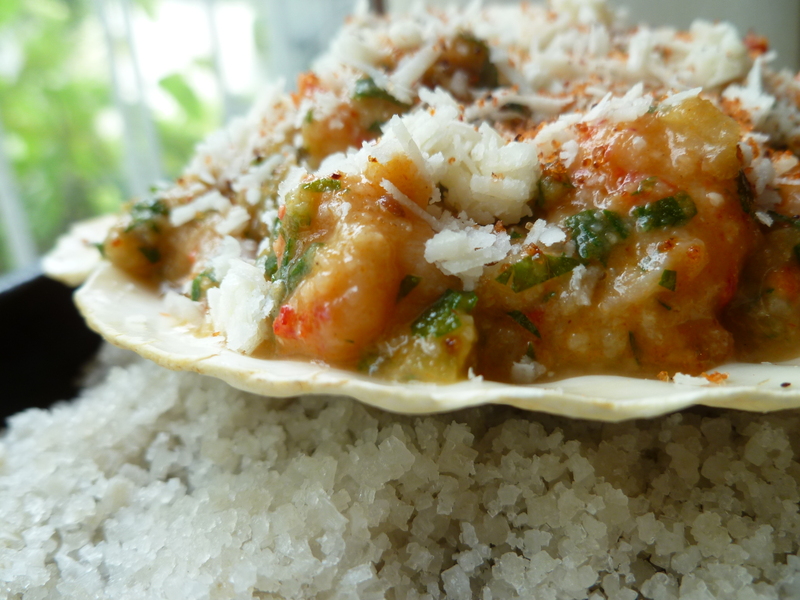 Sprinkle each shell or ramekin with some chopped parsley, garnish each shell with 2 additional crayfish tails and serve. 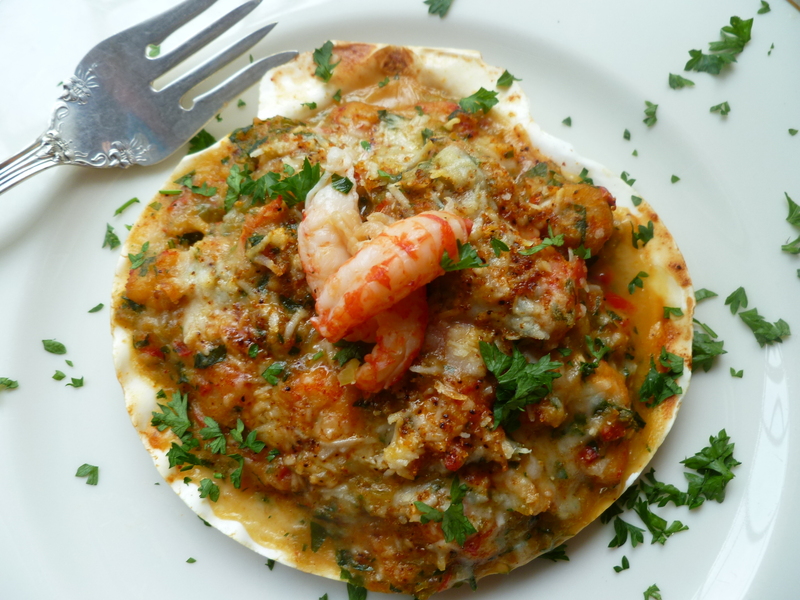 An Alternative Serving Suggestion: Cajun Crayfish may be baked in individual-sized, prebaked tart shells instead. (Tart pans with removable bases, between 3 – 4 inches in diameter, work well.) 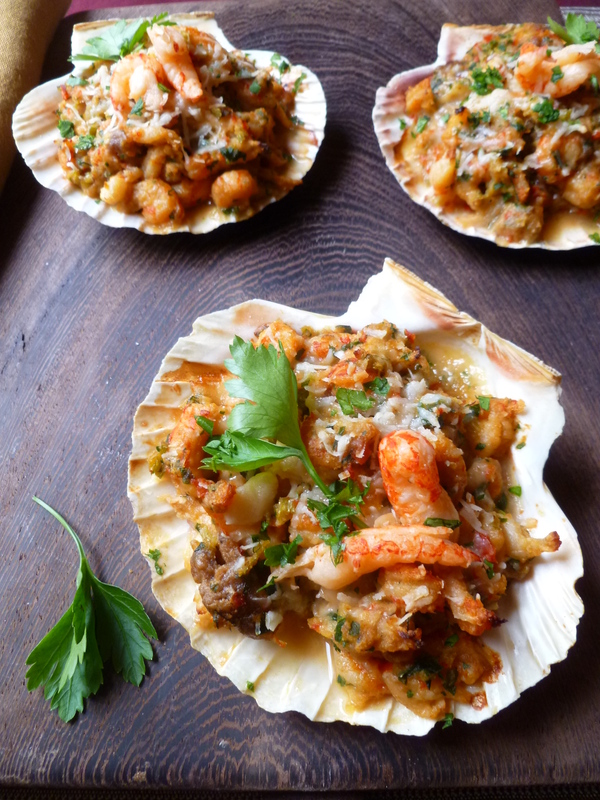 The dish is served as a First Course in the Dinner Menu: Dinner ‘Louisianne’. Also, it makes a good Light Main Course for lunch. 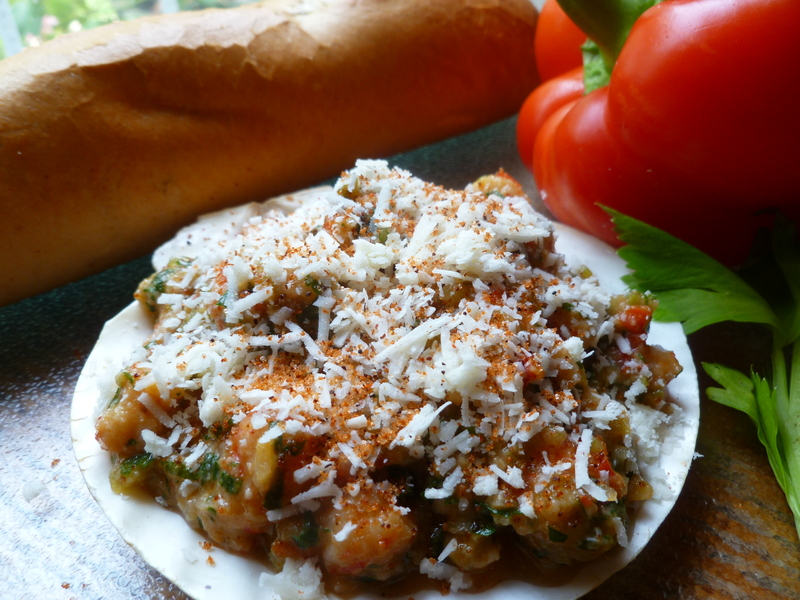 Baked for a shorter time in tiny prebaked tart shells, Cajun Crayfish becomes an Hors d’oeuvre. An Acknowledgement: This good version of Creole seasoning is from The Louisiana Cajun Crawfish Company which is in the business of selling both live and frozen crayfish. A Final Note: If you would like to go crayfish hunting using a more sophisticated trap than the coffee can, this article in the Guardian explains how to make your own ‘crayfish catcher’, how to use it, and how to cook your catch.